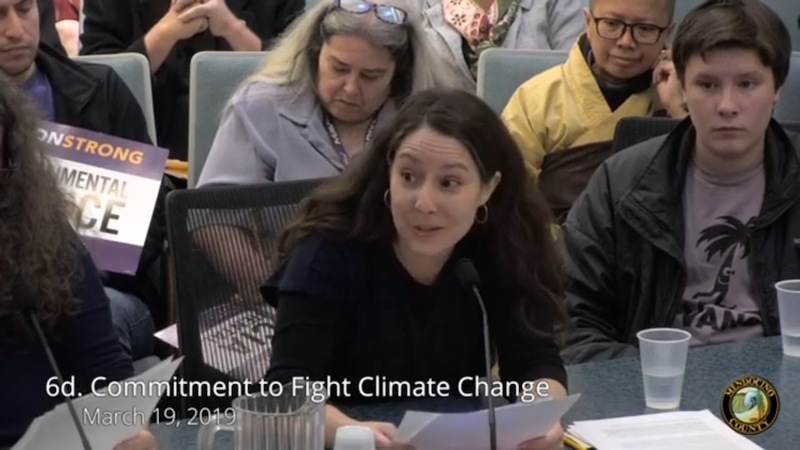 Mendocino Environmental Center's Alicia Bales speaks in support of the climate committee's creation at the Board of Supervisors meeting in March. MENDOCINO Co., 4/15/19 — The Mendocino County Board of Supervisors unanimously decided to move forward with the creation of a Climate Action Committee during their March 19 meeting, after a large public turnout spoke in support of the effort. This Tuesday, beginning at 10 am, the supervisors will discuss how the committee will be structured, how the committee will conduct public outreach and develop a set of recommended goals to address climate change. The meeting takes place at 10 a.m. in the county administration building in Ukiah, and will focus on the structure and protocols of the climate action committee. The supervisors are currently planning to contract with the Mendocino County Resource Conservation District to organize and staff the advisory committee, but the specific arrangement will be decided in the meeting. The public is encouraged to attend and participate to help decide how the committee will be structured. The newly established advisory committee will focus on the ways that Mendocino County can address climate change, including increasing carbon storage, reducing greenhouse emissions, and increasing community emergency preparedness. The creation of the committee was supported by a number of local organizations and residents, including the Mendocino Environmental Center, the Willits Environmental Center, the Social, Environmental, and Indigenous Justice group (SEIJ), the Sierra Club, and Climate Action Mendocino, and many others.